Grades: Pre-K, K, 1 8:30 a.m. - 2:00 p.m.
Grades: 2-5 8:30 a.m. - 3:00 p.m.
Grades: 2-5 Wed. 8:30 a.m. - 2:00 p.m. Welcome to Kendale Elementary School! On behalf of the Kendale Elementary School family it is my pleasure to welcome you to our school. 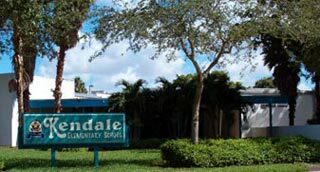 Established in 1969, Kendale Elementary is a neighborhood school that provides an excellent education in a loving, caring, family atmosphere. Through the cooperation and teamwork of our students, staff, parents and the community, Kendale has been the recipient of numerous awards acknowledging our many achievements. Some of our awards include: Blue Ribbon School of Excellence 1996-97; Florida Governor’s Sterling Award 2003 (the first in the county to be recognized); 21st Century School of Distinction 2004 (the only school in Florida and one of only twenty in the nation); and Lighthouse School Award 2004 (one of twenty-three in the nation). These prestigious awards are a testament to our quest for continuous improvement and are the result of our school family’s commitment to providing the best possible educational experiences for those who attend our school. Our school focus is on having high academic expectations and fostering excellence in all that we do. Since close cooperation between the home and school is essential to providing a quality education, we encourage parents to be a partner in their child’s education. A harmonious and productive learning environment is cultivated by the involvement of the entire school community. Our school’s mission, vision and values are infused in what we do by helping us focus on what we are all about. It is a privilege to guide our students and provide them with the educational foundation needed to excel in our society and meet the challenges of tomorrow. We are proud of our accomplishments and of all that we do!